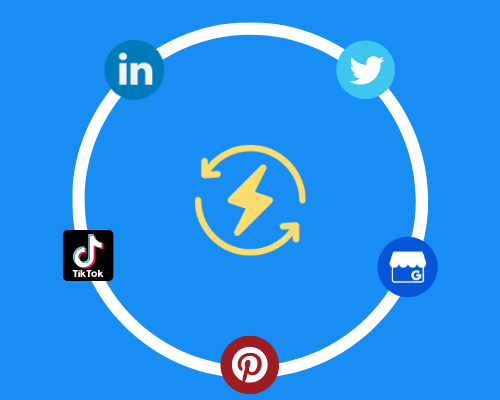 Schedule and automatically recycle your social media posts. Get more traffic by automatically repeating your social media and Google My Business posts. OneUp allows you to create as many categories as you’d like in order to organize your library of posts. Customize your schedule based on when you’d like to share different types of content. Manage and edit your scheduled posts via your calendar. OneUp allows you to schedule and automate your Google My Business posts. Add images, links, and Call-To-Action buttons to your Google My Business posts. Here are even more ways OneUp can help in supercharging your social media efforts —all from a single dashboard. Effortlessly upload and schedule multiple posts at once - plan for an entire week or even an entire month in just a few minutes. Natively add video and GIFs to your posts. Ditch the spreadsheets and content calendar templates. Categories let you manage your different types of content with ease. Schedule your social media in seconds, with categorized queues and a drag & drop visual calendar. Stand out in Google searches by scheduling posts to Google My Business. Schedule your posts to be automatically repeated at the interval you choose, or auto-post via RSS feeds. OneUp helps me get the most out of my blog posts by helping readers see articles they may have missed. It saves me hours of time reposting across social media accounts. The web is crowded and noisy, it's difficult to stand above others. Some tools let you post regularly but nothing offers the possibility to manage your evergreen content the right way. OneUp comes at the right for me and my side project. Time is scarce and OneUp helps you focus on your features by automating your social strategy. You don't need to hesitate, I'm building my strategy right now to have a complete month of content on Twitter and Facebook! We have a worldwide team of customer advocates on standby, so all your questions get an answer, fast.